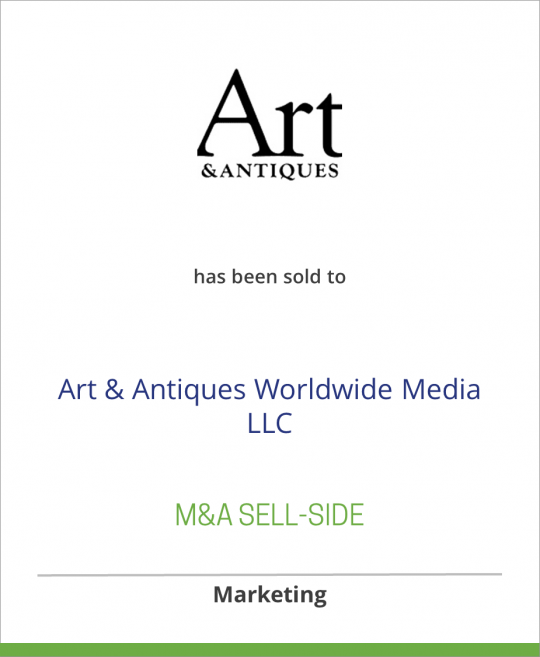 CurtCo Publishing, LLC has sold Art & Antiques magazine to Wilmington, North Carolina based Art & Antiques Worldwide Media, LLC. Phillip Troy Linger, the President and Publisher of Art & Antiques Worldwide Media, will relocate the corporate offices for the venerated title to Wilmington . Editorial offices will remain in NYC, and key editorial staff will remain in place. Sales offices will also remain in California , Texas and New York . • Escalating the online presence of Art & Antiques internationally. The sale of the publication was brokered by DeSilva + Phillips, LLC in New York City . Recognized for more than 32 years as one of the publishing industry’s most influential titles targeted to the affluent collector, Art & Antiques has an audited circulation of approximately 35,000 paid subscribers. The publication will continue to provide collectors and connoisseurs with current news and information on trends in the international art and antiques market, as well as offer reports on prominent auctions, personality profiles and in-depth features on specific works, periods and artists, including painters, sculptors and photographers.